Intel has been releasing small bits of information about their next generation of chips, code named “Haswell” (named after a small farming town in Colorado) for about the last year or so now. Now, as all of the features come to light, it can be seen what a true breakthrough the new 4th generation processors really are. The first batch of “Haswell” 4th gen processors include quad-core i7 and i5 chips for both laptops and desktops, with the most noticeable advancements geared toward the ultrabook market. These “tock” chips, as Intel refers to them, represent a large change in the processor manufacturing process – much more than the small gen 3 “tick” upgrades of last year. The most notable difference is the slight size increase of the chip, with more room to accommodate some of the best on-board graphics released to date – Intel Iris HD Graphics. The Iris graphics will support 4K displays, which have a revolution of 3840 x 2160, or four times the pixels of a 1080p high-definition display. However, we’ll have to wait a little while before 4K goes mainstream and becomes affordable enough to experience. The new line of chips also features the biggest leap in battery power savings that PCs have ever seen in one generation to the next. The details? 50 percent better active battery life and 20 times better idle battery life. “What does that mean to me?”, you ask. Well, that means that you’ll be getting 9 hours of HD video playback where you used to get only 6, and similar increases in browsing the web or working on a spreadsheet. The biggest difference, however, is in standby time. 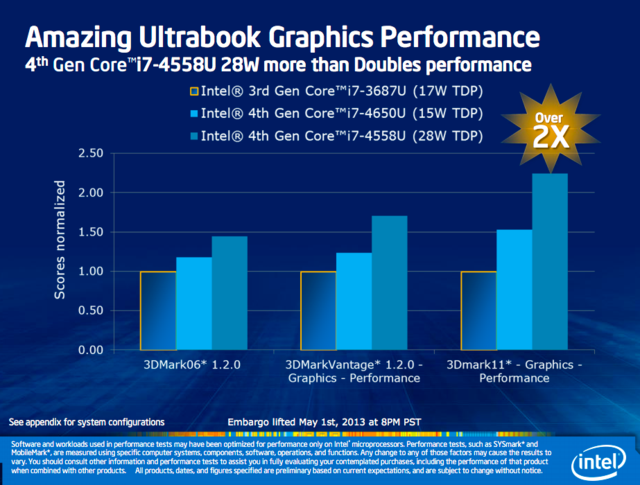 The last gen Ivy Bridge cores maxed at around four or five days of standby life on a full charge – Intel is now promising 10 to 13. 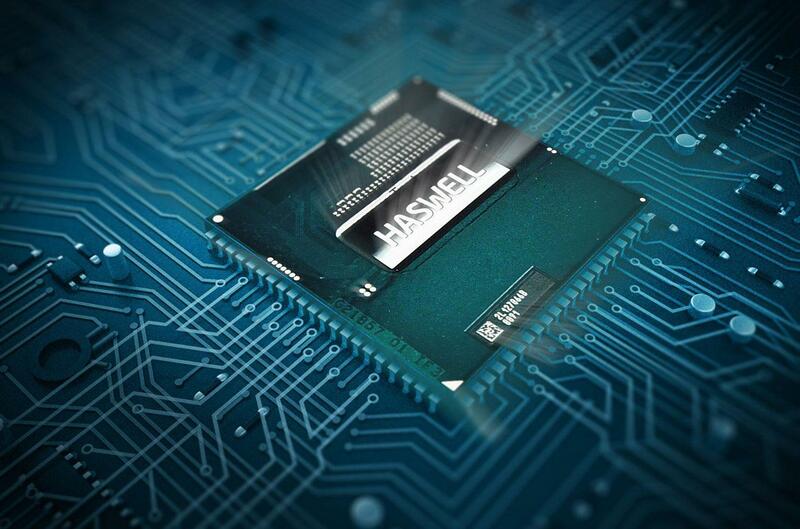 “Haswell” is a much more efficient processor overall, and the results speak for themselves. The industry is already underway producing lighter and more energy efficient devices to take advantage of these gains. Surprisingly, with the new technology also comes a lower cost. Prices for laptops with the new chips will start under $500, so if you are in the market for a new computer or ultrabook, I would suggest waiting until these bad boys hit the shelves in the coming months. 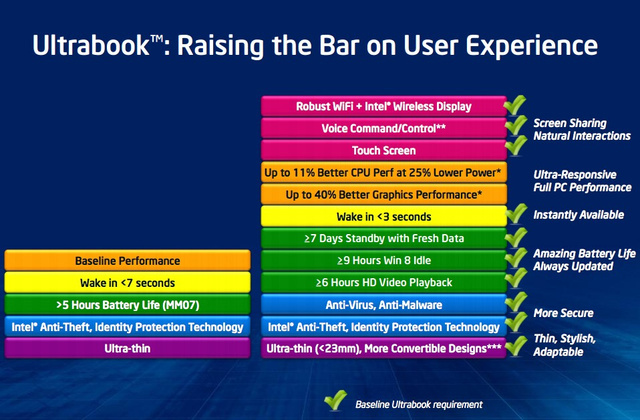 Overall, it looks like Intel produced an all around winner here and you get to reap it’s benefits. You can expect to see systems (and most likely the new generation of Mac systems) with the new processors hitting the shelves on June 4th along with standalone processors being available around the same time.